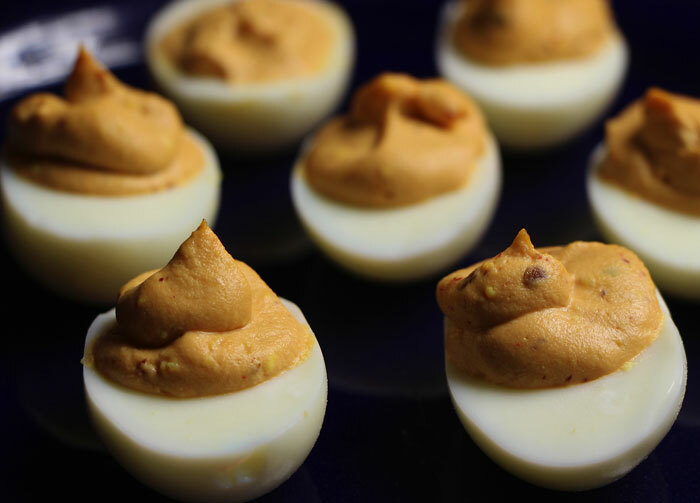 These aren’t you’re Mom’s deviled eggs. Spicy and smoky, these eggs make a great appetizer all year round. Place eggs in a large saucepan. Add water to cover the eggs by 1” only. Cover the saucepan and bring to a simmer over high heat. Once water comes to a simmer turn off the heat and let stand, covered, for 10 minutes. Drain and rinse eggs in the pan until cool. Peel the eggs immediately under running water. Cut the eggs in half, lengthwise. Scoop out the yolks and place them in a medium-mixing bowl. Place the whites on a plate. Mash the yolks thoroughly in bowl with a fork. Add the mayo, chipotle puree, lemon juice and the salt to the yolks and combine thoroughly with a rubber spatula. Taste and adjust seasoning with more lemon or salt if needed. Load up a pastry bag fitted with a ½” round or star tip with the yolk mixture and pipe into the halved egg whites. If you don’t have a pastry bag, use a gallon size Ziploc plastic bag with about ½” of the corner removed. Cover and chill for at least 2 hours before serving. *Pureed chipotle can be made by taking a small can of canned chipotles in adobo and blending them with a tablespoon of water until smooth. Transfer to a small container and cover. Will keep for 2-3 weeks in the fridge.